The current municipal election is about light rail transit (LRT). That’s unfortunate because Hamilton’s housing crisis should really be the main election issue. The second most important topic ought to be road safety. Every neighbourhood in Hamilton is confronting the dangerous consequences of cars speeding and failing to stop on residential streets. And what about HSR, which has been neglected into crisis with fare hikes imposed, again, this past September? Instead of focusing on these three critical issues, this election is mired in a debate that has already been decided many times before. People are losing their homes while others are losing their lives – or learning to live them very differently – and yet we continue to talk about LRT. When politicians mention transit, they all say they support it. However, when challenged by Environment Hamilton’s 2015 Throw Council On the Bus campaign to commute by public transit for a week, only four council members actually got on the bus. Politicians complained that public transit wasn’t adequate for their transportation needs. That’s not surprising. Despite words of support, investment in HSR has been declining for years while fares have been climbing. 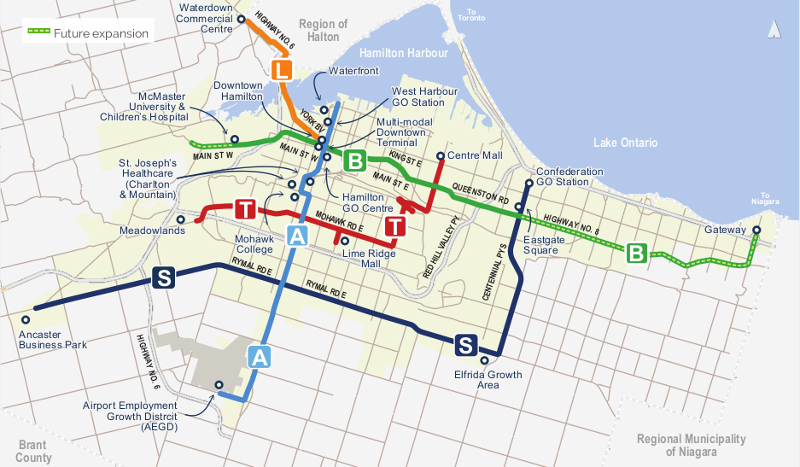 There are two streams of money for transit costs in Hamilton: capital and operations. We pay the operational expenses through the tax levy (property taxes) and the fare box. The capital investments – buses and infrastructure – rely on contributions from upper levels of government. The HSR Ten-Year Strategy calls for capital investment, fare increases, and tax levy dollars in support of the BLAST network. A-Line: Airport to the waterfront. T-Line: Centre on Barton to Meadowlands. Of those routes, B-Line LRT is the only one-hundred-percent fully capital funded project. Hamilton has secured half the funding for express buses on the other four LAST lines over a ten-year period from the federal government. The City is still seeking capital funding for the remaining $150 million on those routes. However, those buses must also be operated – and here is where it gets tricky. Operation expenses are paid in part through municipal taxes, which are area rated. Area rating is a tax scheme that exempts certain wards (ones that were not serviced by HSR at the time of amalgamation) from contributing fully to a public transit that didn’t serve their area. So a resident of “old” Hamilton pays a lot more to ride the same bus as a resident in a post-amalgamation suburb. However, it also means that any transit service added to an area-rated ward (Dundas, Ancaster, Waterdown, and Stoney Creek) must be borne in full by that ward. Area ratings are inherently unfair to all residents, an effective cork on service expansion. Based on average assessed property value and 2018 tax rates. Calculations using the Hamilton Property Tax Calculator. Currently, HSR operations are funded 50 percent at the farebox and 50 percent by the tax levy. In every scenario of “just more buses”, Hamiltonians will pay more taxes and fares will go up. Not so with LRT. In fact, not building LRT will cause taxes to go up and building it will provide Hamiltonians with a tax benefit. Here’s how. At a time of economic uncertainty that includes trade wars, steel tariffs, and official austerity, LRT represents to Hamilton a direct stimulus investment of $1 billion over five years. Of that investment, the lion’s share (about $700 million) is invested into infrastructure owned by the City. The Longwood Road South bridge must be rehabilitated or rebuilt very soon. The LRT will replace the bridge. That is worth $20 million to ratepayers or about $66 on a $300,000 house. The dollars that would have been spent to rehabilitate the 62-year-old bridge can be reallocated to other infrastructure priorities. The upsizing and optimization of underground infrastructure to manage stormwater and population growth is worth $150 – $180 million to Hamilton voters, immediately. In the longer term it lays the groundwork for additional assessment growth. The complete repaving of King and Main Streets along the transit corridor is worth $20 – $25 million to Hamilton property taxpayers. The Hamilton B-Line: Value Uplift and Capture Study conservatively concluded that LRT “would stimulate an additional 350,000 square metres (3.7 million square feet) of development over a 15-year period relative to development in the area without an LRT … [equating] to a projected $280 million in new taxable assessment”. Hamilton’s LRT is 100 percent funded by the province in a commitment upheld by the recently elected government. There is no risk to Hamilton taxpayers, as the Memorandum of Agreement [PDF] makes the province solely responsible for the costs of the project and overruns. The operation and profit and loss is the responsibility of Metrolinx, through its contracted partners. It is true that the Doug Ford government has said the one billion dollars committed to LRT is available for another transit or “approved” infrastructure project. However, that has always been true. Premier Ford is not saying anything different than the previous government. Here is the process: the municipality develops a plan, performs the studies, conducts the consultations, observes the regulatory due diligence, and then asks the province for money. LRT is no different and neither will any future project be different. The financing is committed to LRT. It took 12 years, through three municipal and provincial elections, to get to where we are now – a year to shovels in the ground. If LRT is abandoned, so is the investment. There is no guarantee that any new project developed over a reasonable amount of time will obtain the same level of capital funding, and that includes any unfunded aspects of BLAST. As well, the HSR buses, drivers, and infrastructure made available by LRT can be redirected with the current levy and fares to the LAST lines. They would run at an operating deficit at first, but they would provide Hamilton city council with the opportunity to commit to completing BLAST and building ridership – as so many politicians have so openly supported – and with no additional capital investment. Doing so could promote a phased elimination of area ratings for transit commensurate with service and demand. Agree with me? Vote. Disagree with me? Vote. This is the election to decide this issue once and for all. Let’s go to the polls, elect our councillors and mayor, and then live with the outcome so that we can get to the pressing work of making homes secure regardless of income and roads safe regardless of neighbourhood. See you at the polls.